You haven't logged in yet. If you have an account already then Log In or, if you are new then Register for an account now... it's free! Next in our Champion Born to Shine on the Centre Line series is Angela from North Wiltshire. Angela placed 1st in the BD Online Associated Championship Preliminary Open Class with a great score of 74.23%. When and why did you start riding? I started riding aged six near Liverpool - a hacking centre used to take rides past my kitchen window and I would sit and wait for them so I could see the ponies. Tell us an interesting fact about yourself! I was a Gamesmaker Volunteer at London 2012 Olympics and Paras at Greenwich with the equine events. I was Swindon’s first female DJ!! Cappagh (Cappy) is a 17 year old bay mare, Irish sport horse. I found her in an advert on HorseQuest four years ago. Have you got any interesting stories or anecdotes about your horse? Her previous owners gave her the winter off and I don’t think she was impressed when I bought her and kept her going all year! What level do you compete at? We compete at Prelim dressage but Cappy jumps for fun with the yard staff in excess of 1 metre! 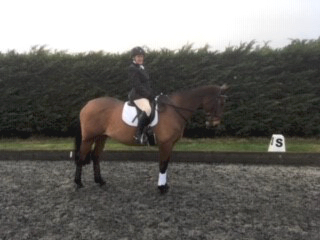 More Dressage Anywhere competitions and try to progress to Novice. No transport and my ever increasing years! What’s your biggest achievement to date? It has to be becoming the Dressage Anywhere BD Online Associated Prelim Champion 2018. How did you first hear about riding with Dressage Anywhere? A friend received a gift voucher last Christmas, I love the access to amazing judges and friendly atmosphere it creates. Sign up if you would like to receive our newsletter. Welcome to Dressage Anywhere, the worldwide online dressage competition website. We launched in 2010 and have members from 82 countries around the world. We hope you enjoy riding with us!